I hope you all had spectacular holidays! I was going to have a spectacular pitch pick today – two actually – but I haven’t heard back from all the pitchers… so I’m either going to post that later or wait until next Wednesday. Meanwhile, for the sake of filling today’s space (and not because I’ve been pushed into it by a headstrong llama who desperately needs a haircut!) there’s a new llama in town! I owe this book a little attention, but I felt like I’d blog-toured myself and everyone else out last summer with LION, ELEPHANT and TRUCKS, and following so close on the holidays I didn’t want to impose on your good nature. So maybe I’ll think up a little something at some point, but for now, I hope you’ll just all get a chance to enjoy the book somewhere! There’s a GoodReads giveaway for this book if you’re interested… and I think I still have a couple copies available if anyone wants one to read and review on GoodReads, Amazon, B&N, their blog, etc… Email me if you’d like one! Happy Holidays! Writing With The Stars Mentorship Opportunity!!! Looking forward to reading Llama, Susanna! Happy New Year! Thanks, Lauri! Happy New Year to you too! Oh, gosh! You’re so sweet to have ordered it, Maureen! Thank you so much! Happy New Year! This looks so cute and congratulations. Thanks so much, Nancy! And Happy New Year to you too!!! All llamas need haircuts. Love this whole series. You are correct, Kathy! 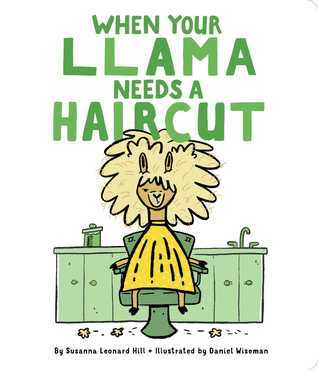 But NO llamas like to HAVE their haircut, so it is quite the challenge! 🙂 So glad you like the series – thank you so much! Hugs, Susanna! No doubt–you’re a writer! And a great teacher, friend, cheerleader . . .
My grandson must be part llama as he has white blond hair that tangles. Would love to share your book with him. My son (to whom the book is dedicated!) is definitely part llama 🙂 If you want a copy to review and share with your grandson, Sue, let me know! Congratulations Susanna, this book looks like a hairball of fun! Can’t wait to read it! Love this book, Susanna…I didn’t realize (or I forgot) that you had a book birthday coming up so soon. You’ve been BUSY! Don’t know how you are still standing. Congratulations, Susanna! This series is so clever and fun. I loves Daniel’s illustrations, too! Thanks so much, Judy! I’m so glad you like it! And Daniel is amazing – just perfect for these stories! Again, the art is fabulous. I’m really looking forward to this, Susanna. Happy New Year! Thanks, David! Happy New Year to you too! Daniel is awesome – no doubt about that! Congratulations! Another fun book for little ones. The art is wonderful! Congrats! I love the sneak peek. Whoo, hoo to you!!!!! Joy, joy, joy! Hope you received my pitch revision. Thanks, Candy, and yes, I did! This looks fun and adorable. I can see it being a big hit with my students at school. 😉 Thanks for sharing and wishing you all the best! Thanks so much, Stephanie! I hope your students enjoy it! Let me know if you want some bookmarks or something! Congrats! This book looks amazing! I hope to read it soon! Thanks, Chelanne! I hope you like it! This books looks so funny!! Looking forward to reading it, Susanna!